As the father of four daughters, I know that nothing is more precious than the dreams of young girls. My girls – like yours – wish for many things: from a new doll or dress to a soccer goal. But most of all they dream of love and of the soul mate in whose eyes love will be reflected. How sweet it is to imagine the wishes that children, and especially little girls, have whispered into the mossy depths of this old wishing well. For all the children who dare to dream, I've created Make a Wish Cottage, a sanctuary where dreams can come true. I believe in the power of dreams. After all, I met the girl of my dreams as a young boy barely into his teens, and my Nanette has taught me to believe in happy endings. 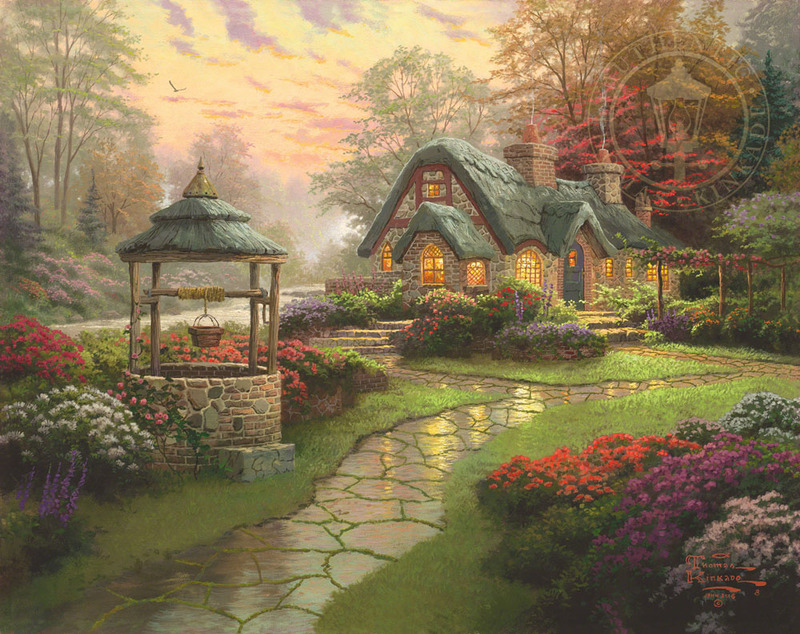 Like Make a Wish Cottage, the home we have created together is lit by the light of love. The gardens here are lavish with flowers; bowers of red climbing roses encircle the thatched roof like a crown. The stream that flows beside the cottage and feeds the well symbolizes God's abundant blessings. I'm especially fond of the network of mossy cracks in the flagstone walkway; they recall the pattern of the walk leading to my own studio. God's glorious sunset reflects subtly in the damp surface of the stony path.